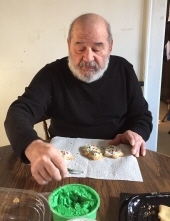 Michael “Mike” G. Penasse, age 78, passed away on March 22, 2019 peacefully at his home. Mike worked for 30 years at Georgia Pacific as a millworker and retired in 2004. In his free time he enjoyed his crossword puzzles and watching sports, football, racing and March Madness. He really enjoyed going to rummage sales and finding all of the hidden treasures. He was former military and is a member of the Menominee Tribe. Mike is survived by his children: Kelly Penasse (significant other, Lacey Markham), Nikki Penasse (significant other, Brittnee Walker), and Kerry Penasse; grandchildren: D’Jordin Markham, Addison Penasse, Riley Penasse, and Danielle Penasse; ex-wife and caretaker, Innette Tordeur; and their new kitty, Cookie. To send flowers or a remembrance gift to the family of Michael "Mike" Penasse, please visit our Tribute Store. "Email Address" would like to share the life celebration of Michael "Mike" Penasse. Click on the "link" to go to share a favorite memory or leave a condolence message for the family.